Danieli will supply an innovative Mi.Da. plant to Shanxi Tongcai Industry (Jianbang Group), in Houma City, Shanxi province. 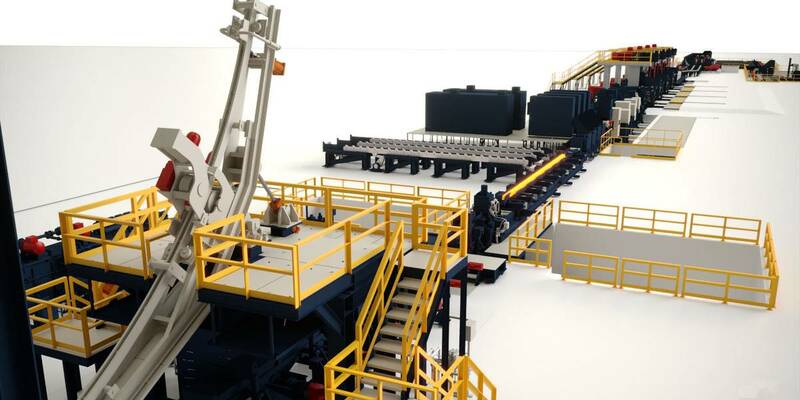 The plant, conceived for future expansion to double capacity, will initially produce 600,000 tpy of quality rebar from 12 to 32 mm dia in endless mode, with one casting strand that has a productivity of 90 tph. Scope of supply consists of mechanical and electrical equipment along with Danieli Automation process control system. The high-speed caster of the new Endless Casting Rolling line will be fed with liquid steel coming from an existing BF-BOF shop. According to Chinese regulations for structural steel, i.e. martensitic-free structure products with higher ductility to better perform in seismic areas, the mill will produce by using Ultra Fine Grain UFG technology performing “low temperature surface rolling”. Danieli China will execute the project with mechanical equipment produced at Changshu workshops and core equipment like patented FCC oscillating unit and power mould from specialized headquarters workshop in Italy. Mi.Da. plants for bar production feature Danieli patented Direct Rolling and Bundling (DRB). The first bundle is expected to be produced within last quarter 2019. Janbang Group produces more than 10 Mtpy of long products. Over the years Danieli has supplied Janbang Group with two wirerod mills and a VOD.